Have you been wondering who is our pick for our men crush this month? Well, your wait is over and we bet you will love this 37 year old charming individual that we got the chance to ask some personal fun questions to. Who doesn’t recognize Andre Amir who rocks his career as a style personality and brand consultant? This man has an amazing sense of style and brings his fashion game everywhere he goes! Read his exclusive interview with us down below. 1. Share with us what your day-to-day schedule is. Luckily, working in a design agency, I have slightly flexible working hours, so in the morning I’ll be heading to work around 10am. This also gives time for my fitness training at least twice a week. One third of the time, I would have media events or social events in the afternoon or evening. Otherwise, at about 7pm, I’ll head straight home, grab dinner along the way, catch up with social media and tv shows in the evening and by midnight, I’m all ready to sleep. I’ll do my best to avoid from attending any events over the weekend, unless it is really important. Otherwise my weekend is my ME time. I’m quite a homely person. 2. We discovered that you have your own blog that you manage. Tell us how you find ideas in the content for your site. 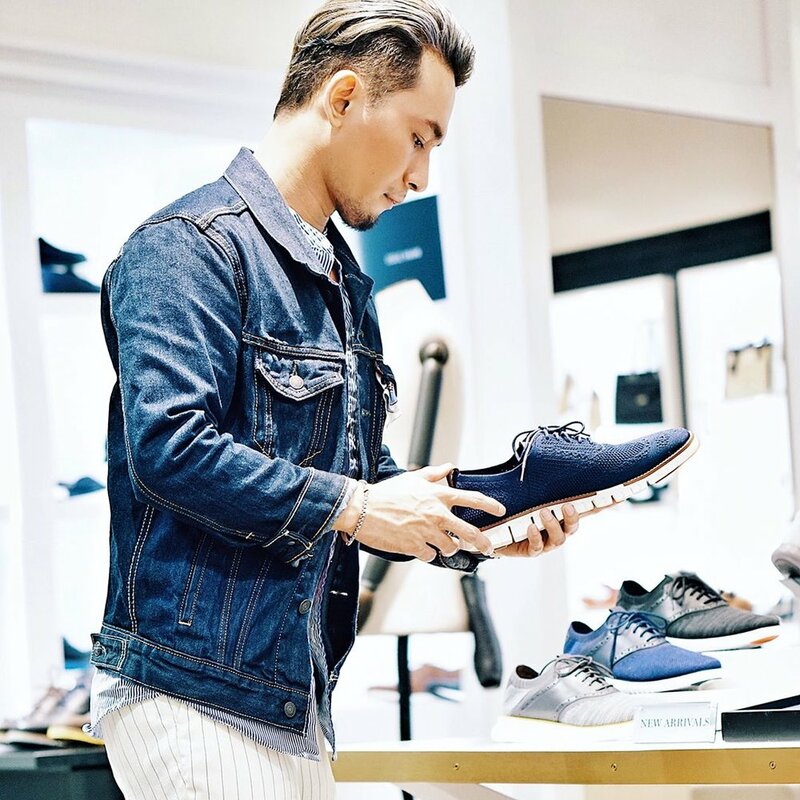 As an extension to my website www.andreamir.com, I started my blog that focuses on premium and luxury men’s fashion in Malaysia. Lately, I’ve expanded the contents to also include men’s lifestyle in general, resonating with the things or brands that I care about at that moment. I see my blog as an extension of the postings I do on my instagram. Other times, it would either be highlights of important fashion season like the fashion week or red carpet. I keep myself updated with news and media releases too, and I’d share that with my readers. 3. Not only that, you are always seen busy attending events and travelling around the world. Share with the readers how you keep that work and life balance? It’s fun, but as you might know, it can sometimes be exhausting. So what I’d do, is to limit myself to only (attending events) weekdays. I’ll do my best to avoid attending any over the weekend because it is the only time that I get to rest or spend time with my close ones. Meanwhile, when I travel, I’d make sure that I get all the comfort I can get - from the perfect airline seats, to the best accommodation possible. I tend to splurge for travel leisure. That I am very diplomatic but can be blunt at the same time. That I am reserved but I can speak my mind when I needed to be. 5. If you can only describe yourself to others in three simple words, what would it be? 6. Describe to us your sense of style. Menswear - suits and jackets, are my work uniform. I work indoors, I meet clients, I go to events – so suits can easily make me fit-in. That’s how I dress to work everyday as brand consultant. I love graphics and patterns, but I also love plains and colour blocking. I know my body, strengths and weaknesses, so I wear myself around it. And jackets - any jacket, from blazer to bomber to denim. It’s like an “armour” for me. 7. We realized that your outfits are always on point. Tell us how do you plan or get inspiration in pulling off amazing looks every single day. Firstly, I don’t think I dress amazingly every day. Haha. It takes so much effort. But to cut down the effort, my work “uniform” can be as easy as a plain T-shirt paired with a suit. I can just grab any suit (and I have just too many) and be ready in a jiffy – and still looking at my best. And I have plenty of jackets/blazers in the car – for “emergency” purposes – LOL. 8. Sneakers, boots or sandals? 9. If you could be best friends with one celebrity from Hollywood, who would it be? 10. What is one embarrassing thing that has ever happened to you? 11. If you have to choose whether to learn how to dance or play an instrument, which one would you prefer? I probably wouldn’t excel in both, but I’d pick dancing! Short forming text (messages) or comments. Or spelling things in the way you talk (especially in Bahasa Malaysia). Please type in full sentences. 13. If you wake up tomorrow and gained one superpower, what would you wished it to be? Telekinesis! I have always wanted to move things with my mind and have dreamed about it, a lot. 14. Name us your most treasured possession. I tried thinking of something but I can’t think of any. 15. If you are stranded on an island, name three things you want to have with you. Are we talking about a resort island? Haha! F&B aside, I want to have my phone and phone charger (for my ebooks and games) – and my hairdryer. 16. If you could travel anywhere in the world, where would it be? So many! But if I had to choose one, it has to be London. 17. Every man should know how to..
google the right keywords. Do this efficiently, you are able to learn and do everything, from fashion to styling, DIY to ethics, all via online. 18. Who has been your biggest support system in life? 19. What would you say for men who are searching for their sense of personal style? Firstly, wear appropriately for your age and career, get comfortable with it and read what fits you best. And never let anyone determine what you like and don’t like. This determines personal style – your personality. Just learn how to dress it well. 20. Let us know, what was the best piece of life advice someone has given to you? Your future is not determined by your past. Be it your background, education or bad decisions. You can be and do anything you like if you set your mind to it. Have you fallen in love with Andre? If you are, do follow him on his instagram @andreamir. Who do want to know about next? Feel free to leave your ideas in the comment section below.